Collecting a debt in Poland can seem impossible. Language and cultural barriers, foreign laws and customs, and sheer distance all impose serious challenges. Debt recovery is simpler when you use a collection agency fluent in the laws and customs of the country where the debtor resides. Cedar Financial offers on-the-ground representatives in Poland who understand the debt collection practices that work to support full recovery of your funds. Since 1991, Cedar Financial has served as a trustworthy, nationally licensed debt collection agency, helping businesses collect unpaid accounts internationally. With knowledge of collecting debts in a wide range of different industries, our experienced team collects your debts quickly and effectively so you can receive the payments you’re owed. With offices in over 150 countries, including Poland, working with Cedar Financial provides you access to a global network of nationally licensed debt collectors. Our in-depth understanding of local laws, customs and cultures guarantees the best possible debt mediation results. Why should we ask you to collect our debts in ? 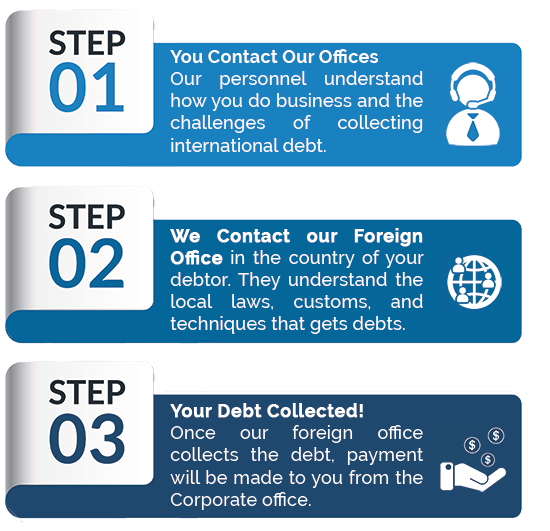 Since 2003 we have successfully operated on the domestic and international debt collection market. Many years of experience, attention to quality and ethical principles make us the company that holds a position of reliable and professional partner to whom you can entrust with confidence, even with the most difficult case. With our international business, we do not set a minimum number of accounts, but do set a minimum value of debt at USD 250.00 per account. We are specializing in both types of claims B2B and B2C, and offer our clients a tailor-made solution which depends on the type of claims i.e. fully automated system for collection, assistance of well-educated staff in more complicated, bigger files or legal services. This greatly depends on the type of debt and the responsiveness of the customer. Yes, we offer visits of on spot and direct negotiations with the debtor. Each visit is confirmed by the relevant report including pictures. This will be billed accordingly. Yes, but only after a requirement of the debtor (we are obliged to deliver documents upon request). Yes, we offer full range of legal services. In case of the judgment yes, legal fees will be added to the value of the debt (B2B and B2C). Collecting a debt in Poland can seem like a daunting task. Language and cultural barriers, foreign laws and customs, all impose serious challenges to collecting debt. Here is some valuable information that may help you navigate the unique challenges faced in Polish collections. Polish law is founded on civil law and uses a codified system. Poland became a member of the EU in 2004, implementing regulations, including Regulation (EC) No. 1896(2006), which creates a European order for payment procedure, and Regulation (EC) No. 861/2007, which establishes a European small claims procedure. There are separate legal procedures for various people and business types. There is the normal timeline in the Commercial Court (see below). Or, if the subject is worth less than 10,000 PLN, there may be an expedited process. Injunctions and seizures may be introduced to protect the rights of creditors. Sole trader: no minimum capital requirement; owner has unlimited liability for the company’s debts. These are usually tradesmen and individuals offering a particular service. Civil law partnership: no minimum capital requirement; partners have unlimited liability for debts incurred. Limited partnership: requires no minimum capital; at least one partner has unlimited liability for debts, with limited partners enjoying limited liability. Private unlimited company with shareholders: requires minimum capital of 50,000 PLN; at least one partner has unlimited liability for debts incurred. General partnership: requires no minimum capital; partners have unlimited liability. Limited liability company: requires minimum capital of 5,000 PLN; partners are liable only for the total value of the company’s capital. Company with shareholders: requires minimum capital of 100,00 PLN divided into shares. The company is liable for the amount of capital held in those shares. The statutory limitation period in Poland is among the shortest in the EU, with only two years for domestic commercial claims and 10 years for a judgement. Only judicial interruption of a limitation is possible. The most common form of payment is bank transfer to the (foreign) creditor’s account or forwarding payment to the collection agency, which then wires the outstanding sum to the client. Other payment methods can be arranged. Separate accounts are set up for the repayment of debts. In Poland, public registers of companies are easily accessible. Depending on the type of company, these registers will contain information on a given company’s solvency and assets. Information on consumers and their assets is protected under Polish privacy laws. Costs over €40 must be verified by documentation supplied by the creditor. Collections agencies cannot add fees without documentation from the creditor. B2C and B2B claims are clearly distinguished in Poland. The latest regulations allow individual debtors to announce a banktruptcy without the necessity of covering their debts. This can be risky for private creditors or loan companies, for all types of unsecured debts. Limited responsibility of the board. Because of the lack of public registers for individuals, it is important to acquire as much information as possible. There is no information available about the financial situation of individuals before legal proceedings have begun – but once started, info is readily available. For companies, financial information is easily accessible from the start, although be aware, data on public websites is not always current. Keep in mind, there are no formalized procedures on how to send reminders to debtors, and costs and fees are agreed on a case-by-case basis. Collections in Poland can be complicated for small to medium sized businesses. When in doubt, remember that debt recovery is much simpler when you use a collection agency fluent in the laws and customs of the country where the debtor resides. Cedar Financial offers on-the-ground representatives in Poland who understand the processes and debt collection practices that work to support full recovery of your funds. For more information on how we can help, contact us today.